There's a distinction between 'belieiving' you own yourself and actually doing so. 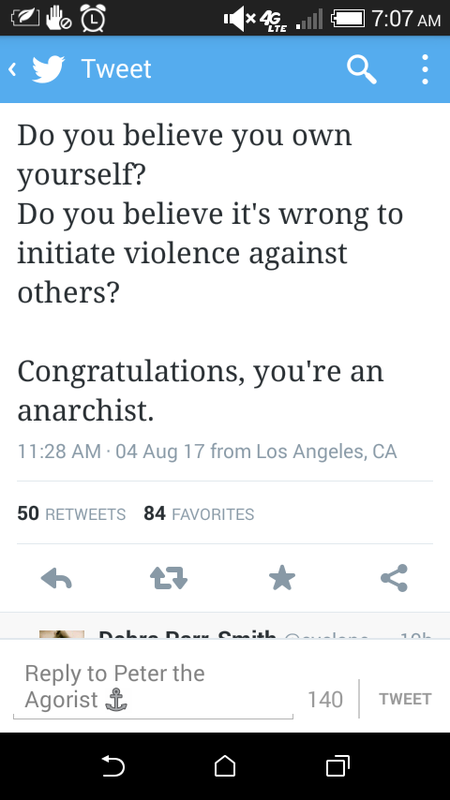 That's why I've often contended that anarchism sounds nice in a vacuum, but everyone is accountable to someone else or has others accountable to them. This may not necessarily equal ownership, but like Marxism, this kind of thinking can quickly turn into an ideology which sees all social interactions through the lense of power dynamics, but power strictly meaning coercion. There is also the power of skill and charisma and natural persuasion. I don't think the free market is the answer that libertarian-types will ultimately think it means, because there's always the chance that you could get one group who is good at providing many services at once. I'm certainly not against one group having a monopoly on many services if they're efficient, but I wouldn't want moving to be the only option if the monopoly wasn't working. Owning yourself is certainly the goal, but if all that means is the ability to pay for whatever I want, I can't help but see this kind of self ownership as a half measure.